Stony Brook, New York 11794, U.S.A.
Crystals of CaCr2+Si4O10 were synthesized at 1 atm and 1400-1350°C in a closed system with fO2 <10-16 bar. CaCrSi4O10 crystallizes in the space group P4/ncc with a = 7.378(5)Å and c = 15.119(2)Å. The structure was refined to R = 0.026 (Rw = 0.031) based on 546 reflections. CaCrSi4O10 is a structural analog of gillespite and other ABSi4O10 compounds, and although not itself a mineral, has been shown to exhibit structural and comporession properties nearly identical to those of gillespite. The most interesting aspects of the structure are the square-planar coordination ofCr 2+, and the Si-O1-Si bond angle of 176.8°. Apparently, Cr2+ is stable in the gillespite structure because it is readily accepted into the square-planar site, in contract to other Cr2+ compounds that are distorted from type structures as a result of the Jahn-Teller effect in Cr2+. 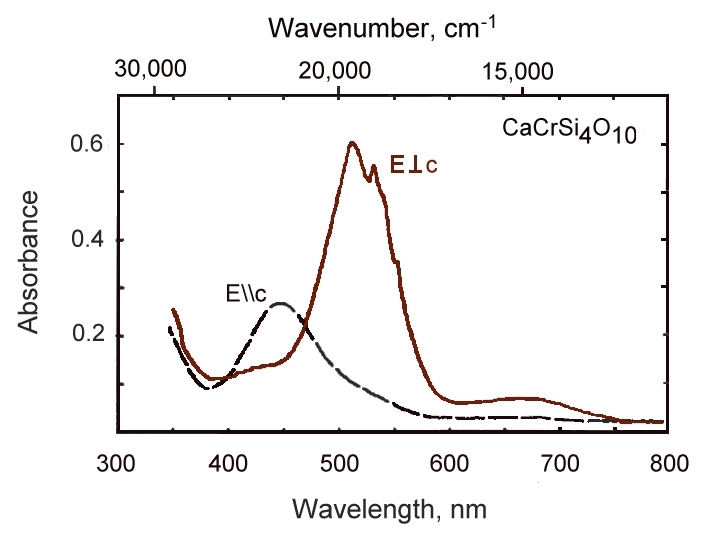 The optical absorption spectrum of CaCrSi4O10 has bands at 511 and 670 nm polarized perpendicular to c and at 453 nm parallel to c, with all absorption occuring only through vibronic coupling. Diamond cell experiments indicte that CaCrSi4O10 remains tetragonal to at least 50 kbar, with compression behavior identical to that of gillespite.